The Phocos MTS Temperature Sensor for MCU is an external temperature sensor specifically designed for the use in PV off-grid and PV hybrid-systems. It is an accessory for the innovative Modular Power Managent (MPM) family from Phocos. 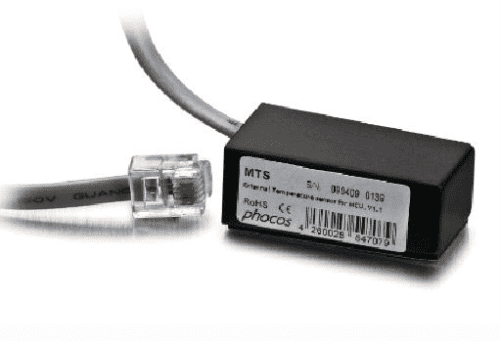 The Phocos MTS Temperature Sensor for MCU can be integrated when the Phocos MCU is available in the system design. All components within the MPM family are equipped with internal temperature compensation. Should the temperature at the battery bank be significantly different from the temperature at the MPM components, MTS can be used to measure battery temperature and optimize the battery calculation.